a story of my FIRST EXPERIENCE with snow, and it was too much snow. up to my waist with frost bitten hands, and a numb face on that chilly morning — an intruder. I would fast lose feelings in my legs too, if I don’t decide what to do fast. Behind me, the sun was lazily floating up, but enveloped by the giant clouds, it failed to give warmth. But rather its light threw shadows over the omnimously pure white landscape, outlining distance mountain ranges which stared down at me coldly like imposing giant guards. I blow out a sigh and smoked like a dragon, mirroing the steam rising from the lake in front of me. “This is what I came to see?” I cried out. There were only a few orange brick structures, some 1000 years old, still standing only with scaffold support before me. 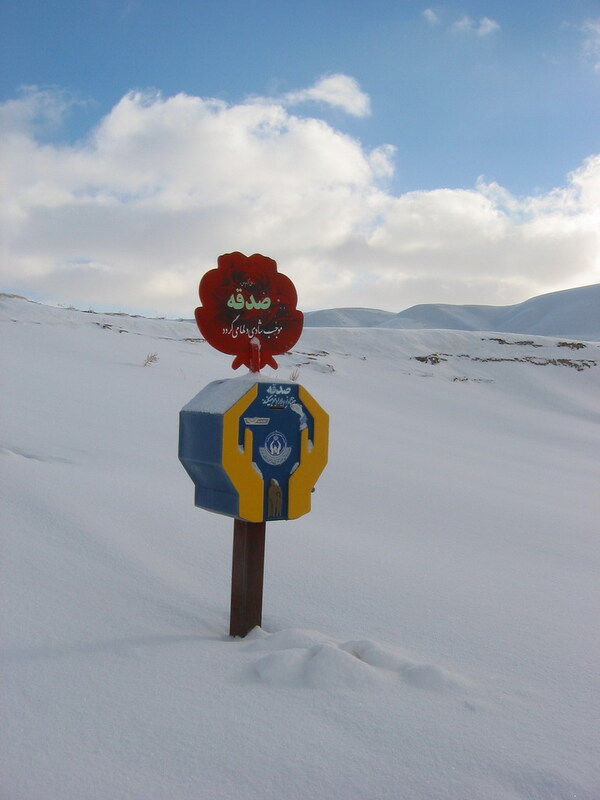 The bricks — collectively known as Takh-e soleiman (throne of soloman), the few who manage to poke up from under the piles of snow at least, do not respond, of course. 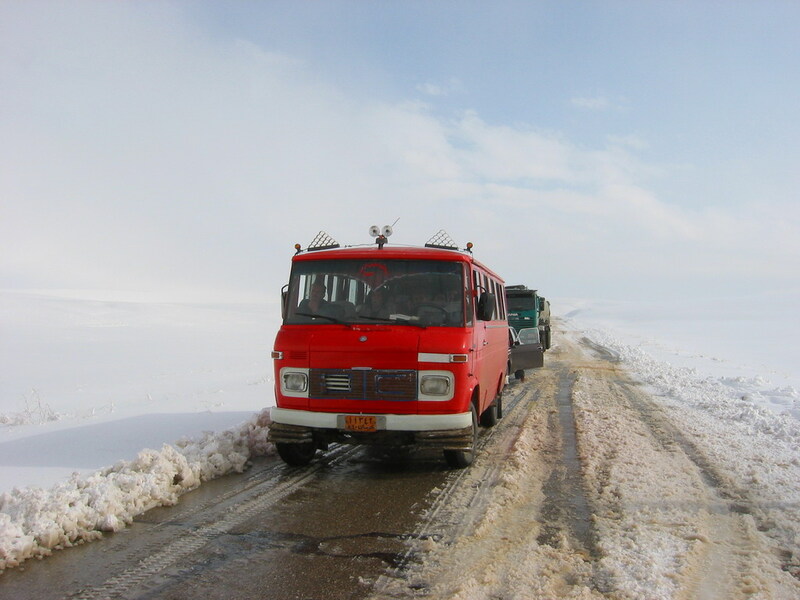 when I was on a bus to Bijar, the SNOW menace was already brewing up a storm but it didn’t quite look as scary, from behind the window of a bus. 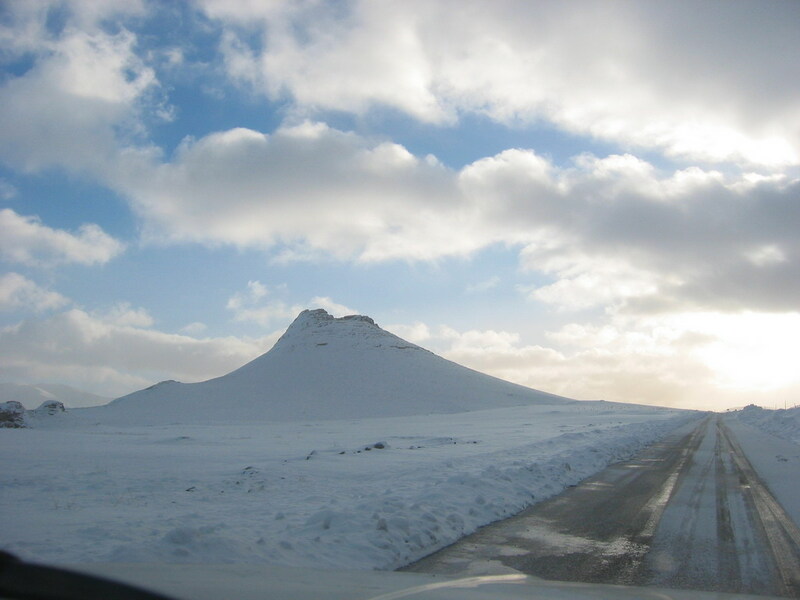 The bus struggled through slushy mud roads and rocked away but I was dreaming of chocolate ice cream again as the sight of chocolate brown mountains covered with snow. 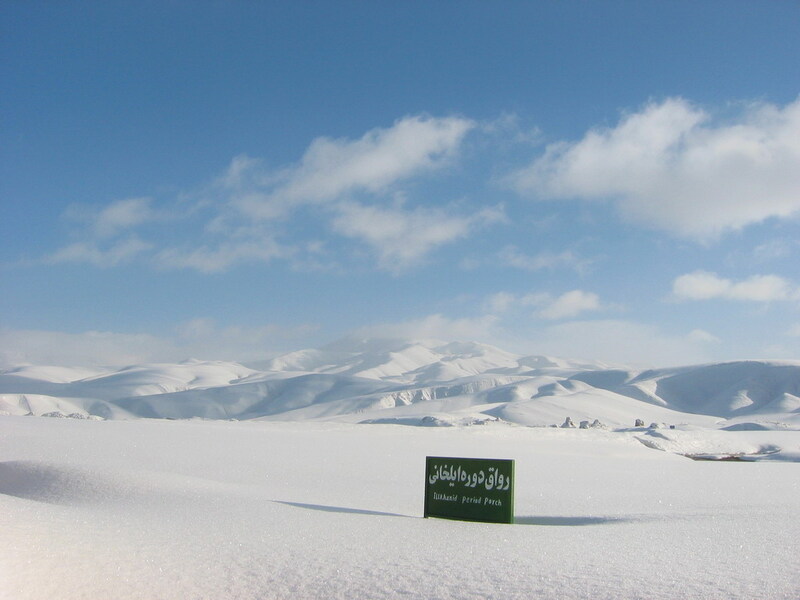 I reached the town of Bijar which from afar appeared as a little brown dot in a sea of white. I jumped off and a crowd in the untouristed town gathered to watch me struggle with my bagpack. “When’s the next bus to Tekab.” Nobody says anything. Tough crowd. I am on a smaller bus to a smaller town, TEKAB. If before the environment was stark with trio colours — white, blue and brown — now even the brown was being lifted out. I can feel the SNOW MENACE getting stronger, it covered just about everything and even the blue sky hid in thick clouds. 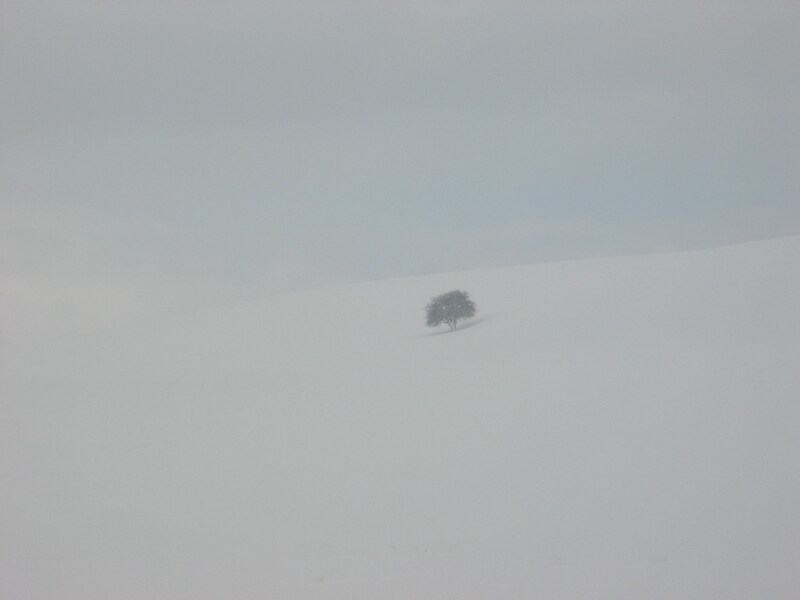 Soon, my window also turned all white as if I am passing through a cloud on a plane. But luckily I was NOT on a plane as the bus jerked to a complete stop. The SNOW has claimed a part of the road. We had wait for the FORCES of the snow plough to rescue the TAR, before we could continue. I reached Tekab in the middle of a full scale SNOW attack. SNOW flakes flew horizontally at every passing car and pedestrian and has started to whiten the streets and the shops that line this small town. My way blocked, I had to take refuge in Tekab, a town full of farmers, who when unable to plant in the winter, strangely, take to pirating latest computer softwares, MP3s, and latest movies. There were MORE commercial CD-burners per capita in Tekab than anywhere else I have been so far. You think I exaggerate? I am not. after a night’s rest, I proceeded into the lair of the SNOWLAND. Again, everything that was once a picturesque countryside, small towns had been swept away, replaced by a dull pale white. Only a black tar road rolled out like a tongue to welcome me into the mountains, where the heart of the BEAST surely lay, that particular spot radiant as the sun shone down from behind the clouds. I was dropped off by the taxi just below the citadel which stood on a hill. I walked the way up and chased by the ticket seller who went pass me looking like he had seen a ghost. I found out why when I reached the gates and stood ground against the wind which threaten to blow me off. They had given up the FIGHT. 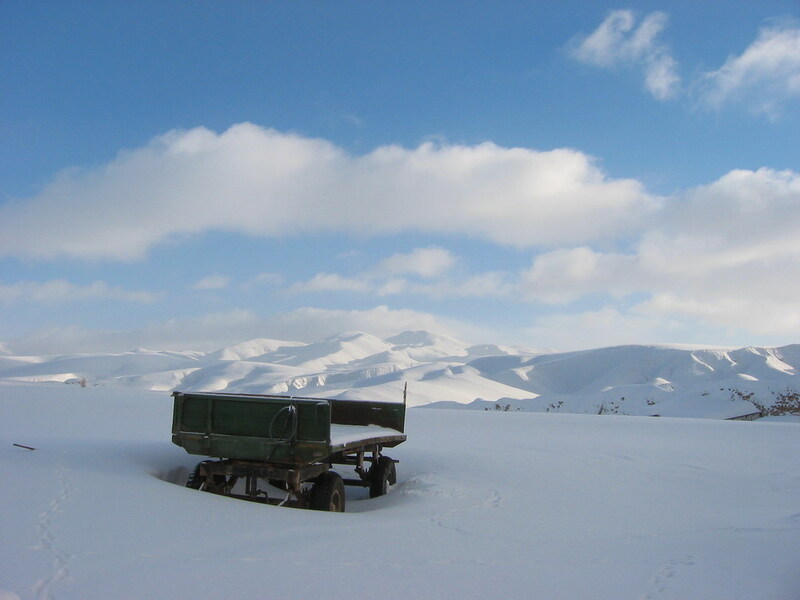 A plough stood half buried in snow, with everything else already covered. I asked “How do I proceed?” and the ticket seller walked away laughing. BACK TO NOW AGAIN, I feel defeated too. After marching Russian style for 50 metres, I am getting nowhere, the SNOW is getting higher. I look back proud of the depression marks I have made and thankful that it did not reveal how my cowardly heart had skipped with each step I took, for I never knew how deep in I would fall. There is no ground. 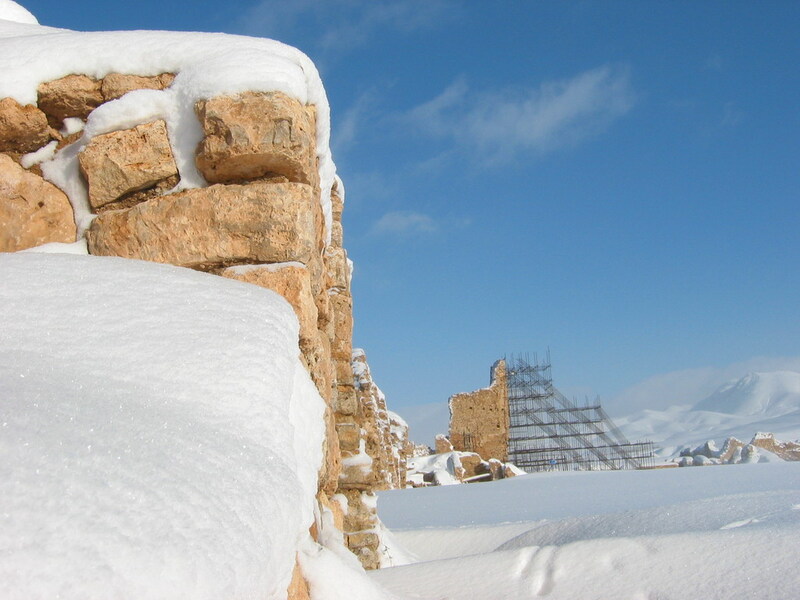 Takh e soleiman, the citadel with historic ruins ranging from 600 to 1000 years old, through several empires, an epic sight in Summer, is NOT meant to be visited in the winter. Dromoman, meet your adversary for the NEXT TWO WEEKS — SNOW MENACE. It’s going to make travel difficult. I am not yet ready to go however before one final act. I pulled down my pants, and took a PEE right where I stood, grinned, as my body fluid melted at least some of the snow down. And I laughed hard for the first time in 24 hours. ← Meeting Iranians : Bring me to your leader!